The first thing that strikes you about Le Faîte is its intriguing label. A wooden tag hangs from a wax seal in a nod to the winegrowers of the past who kept their wines under the clay soil and would mark the bottles in order to identify them as such. The clay conservation allowed to maintain the wines with a constant temperature and humidity, and it is a mark of quality that is preserved today. 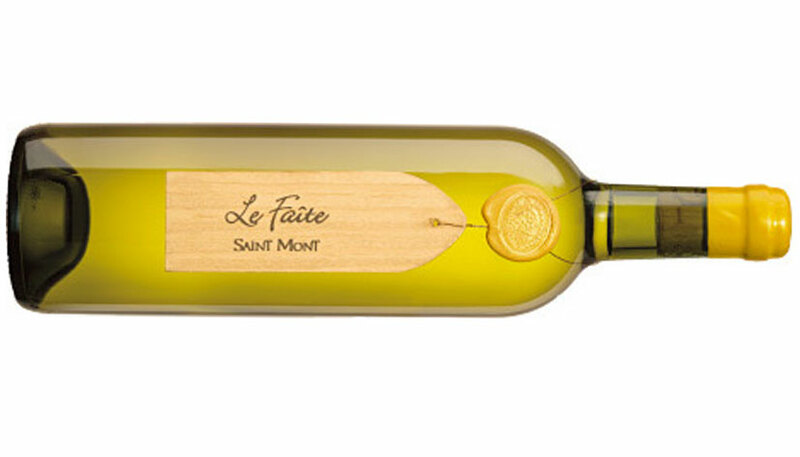 Although modern methods of storage have advanced the wines of Saint Mont have become no less acclaimed. Its luxurious apéritif style, with bouquet fragrances and a velvety, slightly off-dry taste is a year-round winner for dinner parties, bringing the grapes of Gascony to a global audience. Located on the first slopes of the Pyrenean foothills, the Saint Mont appellation covers 46 communes in the west of the Gers department. There they prosper from a particular, cool micro-climate and extremely fertile terroir. It uses local and ancestral varieties: Tannat, Pinenc, Cabernet Franc and Cabernet Sauvignon for the red and rosé wines, Gros Manseng, Arrufiacand et Petit Courbu for the white wines. The white wines are original, fresh and well balanced. They express aromas of citrus and yellow fruit with an attractive minerality. Expect an explosion of citrus fruit, litchi and gunflint on the nose which slowly softens into an elegant minerality. Lifted aromas of tropical fruit on the palate that slowly give way to a greater complexity of mineral notes with a noble touch of undergrowth. Great with subtly-flavoured white meats and mature cheese, but I would advise opening as an alternative to fizz in the cold winter months.